all the enthusiastic gargoyle hunters who came out for the Faces on Places walking tours! You have motivated me to update and maintain this blog after a lapse (due to the crush of work at my day job). Stay tuned – new posts coming soon! Keep looking up! For those of you who couldn’t make it: CTV News walked with us on the first tour on Saturday (http://toronto.ctv.ca/ – look under “Latest Videos” tab on the right for “Doors Open city architecture tours kick off”), and CBC Radio’s Here and Now promo’d the walks on Friday but they don’t seem to have archived the interview (or not yet). Hi Terry . . . Congratulations on drawing such enthusiastic crowds to your gargoyle walks. Sure wish could have been there but please ink me in (as they say in showbiz) for a future edition. I still love FAces on Places, keep it beside my bed and pick it up frequently for a happy browse. Keep up the good work. iw. Thanks, Isobel! You can have a personal tour any time you like! 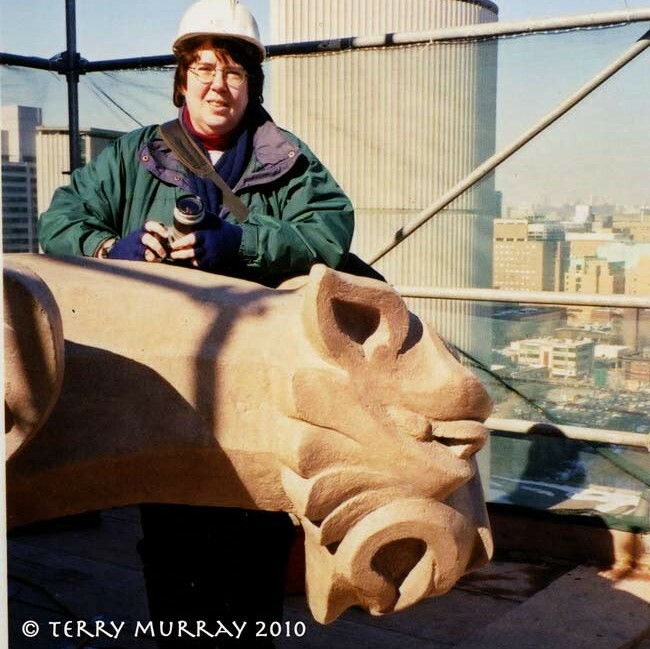 Thanks for your comment on my post from 2007 about the gargoyle at Toronto's old city hall. I appreciate the info and have attributed the correction to you. Nice to have a gargoyle expert on board. Best of luck with your walking endeavor.